Hip belt squats are an area of lower body training which is often overlooked. Powerlifters and serious weightlifters have been using them for a very long time to enhance the strength of their legs. But they are often not considered by the mainstream gym user. Or they don’t even know about them. Squats with a hip belt are unique because they provide a method to squat bilaterally without adding pressure to the spine. This makes it especially good fit with back injuries. Many people with back pain struggle with the loads on the spine when it comes to regular squats but hip belt squats get around this by placing the load on the legs and hips instead. Hip belt squats also work very well for lifters with shoulder wrist or elbow injuries which prevent them from supporting the bar during normal squats. Hip squats also target the lower body in a more direct way than back squats. Back squats are often limited by the strength of the lower back while hip squats circumvent this. By doing this, they work in a similar way to a hack squat machine or leg press delivering little to no stress on the back while still providing the balance and stabilisation benefits of a normal squat. Something else the people don’t realise about hip squats is that they are very portable. They are greats to do in a gym that is crowded as can be performed in many different places while people are still queuing for the squat rack. Now, hip squats are not the only leg exercise that you should do, but they are definitely a beneficial exercise to add to your routine. 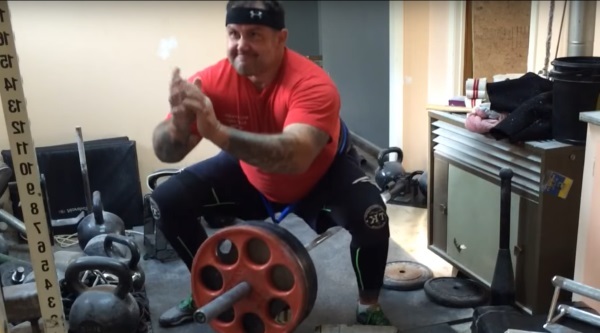 One issue with hip belt squats is that they can be difficult to set up sometimes. One of the best ways to perform them is via a machine, but many gyms do not have these available. If you have access to one, you are very lucky. The most common way of performing squats with a hip belt is to stand on a pair of boxes or benches with a space between them for the wait to hang which attached to you with a dipping belt. 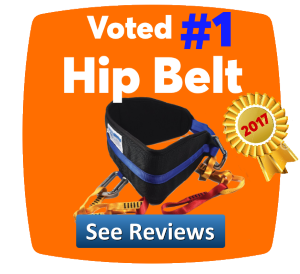 Check out our other page on selecting the best weighted dip belt. Another useful piece of equipment is squat shoes. These can drastically improve your squatting ability. Hip belt squats are effective for working the legs but some stronger powerlifters can find that they are limited on how much weight that they can attach to their belts. Also, some gyms do not have enough weights or dumbbells to make this challenging enough for the legs. A good way to get around this limitation is to get a loading pin. This allows you to stack many plates vertically and attach them to your belt. This should be more than enough weights that you will ever need. There are a few things to note when performing dip belt squats while standing on boxes or benches. Be sure to perform them with the boxes on a grippy surface as they can tend to drift apart during your set. If not prevented, this could end in a groin strain so performing them on a rubber floor is recommended. 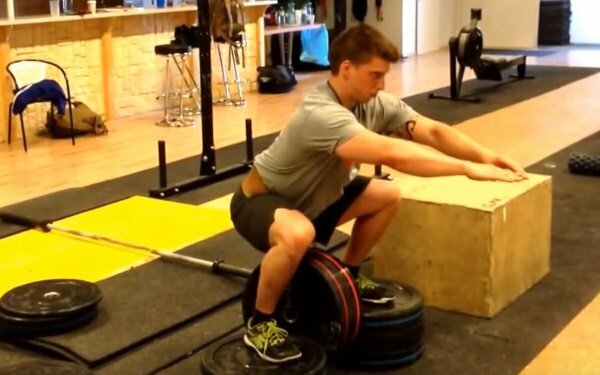 Another minor issue with this way of performing belt squats is that it can be a little unwieldy to get in position and even more difficult to get down off the boxes afterwards. There is an alternative however, which will go over shortly. This requires a cable station with a low cable and also your regular dipping belt. Attach your belt to the low cable and move about 8 feet away from the machine. Then perform a squatting motion. As you rise there should be some resistance created by the cable machine. When performing this you have to make sure that you grip onto the floor with your feet and push back slightly throughout the exercise in order to stop yourself from being pulled back towards the machine by the cable. This cable also creates a constant load on the legs and not just when going up through the squat. For this you will require a barbell or T-bar and dip belt. If you’re using a barbell, you should either place one end against the wall or have someone stand on it to create a T-bar effect. With your newly created T-bar, you are almost performing good old T-bar rows but squatting instead of actually rowing. You should attach some weights to the opposite end of the barbell to the wall and then squat down with your dip belt and attach your belt to the bar. You may have to wrap your chain around it a few times so it is short enough. Now as you stand the end of the barbell should come with you while placing load on the legs. This works in a similar way to as a normal hip belt squats with a loading pin but it is the easier to get in to position and you don’t require loading pin. It is also more comfortable than having the weight dangle between the legs. Hip belt squats are a great exercise for those who do not wish to have a bar resting on their back or shoulders. They are great because you can go all in without worrying about getting yourself into trouble if you can complete the next rep. With full-back squats if you did that, it could end in disaster. They are a great supplemental exercise, but not staple. If you only did hip belt squats, you would definitely be missing out from the gains provided from full squats and deadlifts. But if your gym’s squat rack is dominated by squatters or even losers doing curls in the squat rack, then these are a great addition to add to your leg routine. I used to do these a lot when I had a back injury. It’s great to have the sore leg feeling the next day without that lower back pain that you can get with squats.